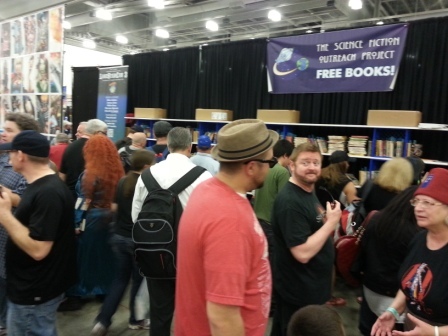 By Helen Montgomery: This year, with Worldcon being in San Antonio, the SFOP decided to head on down to Dallas Comic Con to give away books and tell attendees about LoneStarCon 3. Our saga begins on Wednesday, May 15. Three of us were heading down from Chicago – but Mother Nature intervened with a bunch of tornados. We were all grateful that we weren’t stuck in the storm, but it certainly threw off our stride! 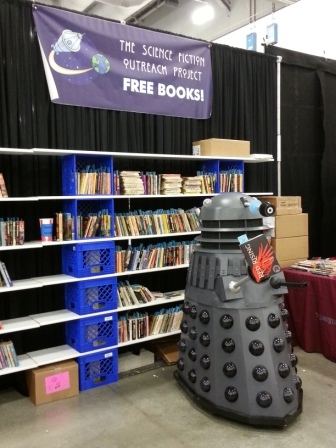 We finally all arrived at the convention center on Thursday, ready to move in our three pallets of books and shelving. There had apparently been a miscommunication along the line, and instead of having our expected two 8′ x 10′ booths, we had two 8′ x 7′ booths. Having only 14′ feet of width is a problem when your shelves are 16′ all by themselves! We scrambled a bit and came up with a layout that involved only half our shelves and two tables with shelves built up on them. Friday went well, but we were a tad anxious how the smaller space would work on Saturday. Fortune smiled upon us though, and the people who had the booth across the aisle from us never showed up. 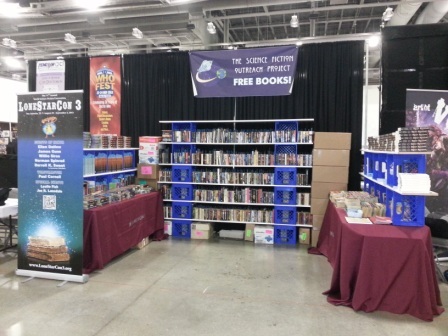 Our friends from Fencon / WhoFest had the booth next to us and they were able to move across the aisle which allowed us to expand to our full set up using their booth space. They were also delighted with the move, as they now had space to bring in their full-sized Dalek. All is now well in the universe! Our usual setup — hooray! Saturday went fabulously well. 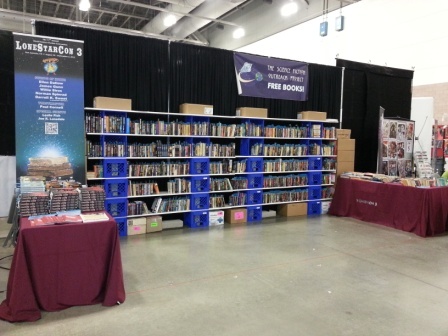 We gave away a lot of books and talked a lot about Worldcon. As usual, our booth was crowded the whole day with people coming back over and over, bringing along their friends. It was great to see strangers chatting and recommending books to each other. Kids and teenagers had a great time going through their special boxes. Typical scene for the weekend. We did it all over again on Sunday. Towards the end of the day we had more boxes left than we had anticipated (largely due to being able to put out significantly less on Friday that we usually do), and a few people asked if they could take away full boxes – without even knowing what was in them! Apparently they figured that a box of authors with last names starting with “C” was a good bet! That, folks, is why we do what we do. A new fan has been brought into the family! Thanks, as always, to everyone who donated books over the last year. We thank the conventions that sponsored book drives, and the publishers who sent us books, and the groups that gave us grant money to pay for our expenses. We would also like to thank Brad Foster for our new tip jar artwork! Brad Foster’s tip jar art. We’re planning to head across the pond next year to help our SFOP compatriots in London at one or two comic conventions there, which will help promote Loncon 3. We are exploring options for an event in the U.S. as well, but have not finalized any plans. 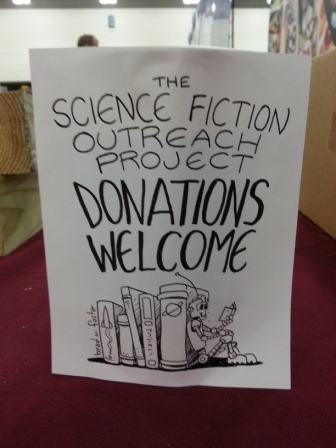 Please feel free to email us at sfoutreachproject@gmail.com if you’d like to donate either books or money, and don’t forget to “Like” us on Facebook (Science Fiction Outreach Project – USA). This entry was posted in Conventions, Worldcon and tagged Dallas Comic Con, Helen Montgomery, LoneStarCon 3, Science Fiction Outreach by Mike Glyer. Bookmark the permalink. What a lovely idea! Does my heart good to know that something like this exists, not only to encouraging reading in general but to sow seeds of passion for one of my favorite genres. Thanks for sharing the story about the young man and 100 Cupboards. That is the kind of thing that makes it all worthwhile, I imagine.